So, continuing with bladder cancer and TCC the symptoms we need to be aware of with TCC is blood in the urine, straining to urinate and frequent urination. However, as usual, symptoms can also be associated with other infections, like “urinary tract infection”. In carrying out further research on this “problem” I stumbled across references to dogs that had been exposed to herbicides. It would seem that there was a significant increase of TCC in dogs that had been exposed to lawns or gardens treated with herbicides and/or insecticides. It is a well known fact that herbicides are suspected of causing several cancers in humans. With the latency period being much shorter in dogs, it may be much easier to link early exposure with cancer. The dog genome has recently be completed mapped by scientists in America and more work by vets and scientists is now being undertaken to identify those human cancers/ailments which can also be contracted by dogs and our scotties in particular. This shorter latency period is helping vets treat dogs with symptoms that we humans can be afflicted with, and if successful in the dogs, the outcome will look good for us. However, getting back to today’s environment, if you think your scottie may be predisposed to bladder cancers, perhaps a routine urine test should be carried out every 6 months. This is more directed towards our scotties who have reached a more maturer age of 6yrs and over. It would certainly provide a baseline for future tests, and by having the tests done every 6 months, you will be able to treat the symptoms just that little bit quicker. Obviously there is a cost associated with regular check ups – do speak with your Vet first to find out how deep your pockets should be! As is usually the case, diet may play an important role. My own research and reading about bladder cancers, came about because Kelpie had to have bladder stones removed. 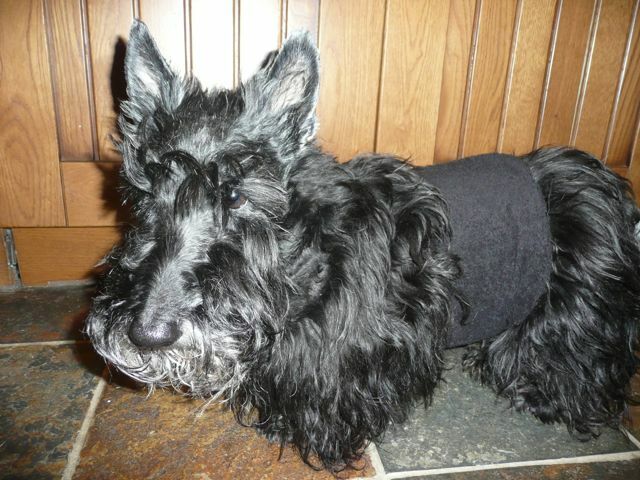 It seems that our Scotties should be offered fresh vegetables, at least three times a week. In particular the emphasis is placed upon carrots! They “help us to see in the dark” or so I was told when growing up, so why can’t they help with bladder cancers in the dogs. No one knows for sure just what quantities of fresh vegetable to give, but I ensure that fresh and steamed carrots are available at all times for my scotties.